Citation: C N Trueman "Children and World War Two"
Children were massively affected by World War Two. Nearly two million children were evacuated from their homes at the start of World War Two; children had to endure rationing, gas mask lessons, living with strangers etc. Children accounted for one in ten of the deaths during the Blitz of London from 1940 to 1941. World War Two was the first war when Britain itself was the target of frequent attacks by the enemy. With the success of the Battle of Britain and the suspension of ‘Operation Sealion’, the only way Germany could get at mainland Britain was to bomb it. This occurred during the Blitz and seemed to reinforce the government’s decision to introduce evacuation (what the government of the time described as “the biggest exodus since Moses”) at the start of the war. On August 31st, 1939, the government issued the order “Evacuate Forthwith” and ‘Operation Pied Piper’ was started the very next day. The impact of evacuation on children depended to an extent on which social strata you were in at the time. Parents who had access to money invariably made their own arrangements. Children at private schools based in the cities tended to move out to manor houses in the countryside where children at that school could be, in the main, kept together. But 1.9 million children gathered at rail stations in early September not knowing where they were going nor if they would be split from brothers and sisters who had gathered with them. ‘Operation Pied Piper’ was a huge undertaking. Six cities had been deemed vulnerable to German bombing – memories of Guernica were still fresh – and in London alone there were 1,589 assembly points for children to gather at before they were moved on. Those children who were evacuated were given a stamped postcard to send from their billet address to inform their parents where they were. ‘Operation Pied Piper’ planned to move 3.5 million children in three days. In the event, the 1.9 million who were evacuated was a remarkable achievement though some children stayed with their parents as evacuation was not compulsory. With such numbers involved, it was to be expected that some children would have a smooth passage to their reception area while some would not. Anglesey expected 625 children to arrive and 2,468 did. Pwllheli, North Wales, was not allocated any evacuees – and 400 turned up. Children already experiencing a stressful situation were put in an even more difficult situation. Elsewhere, children who had been used to being in school in the same class were spilt up. What impact this had on the children involved was never overly studied at the time as the government simply wanted to herald evacuation as an overwhelming success. That some children continued their education in pubs, church halls or anywhere else there was the space to accommodate them was seen as the accepted face of a requirement that had been foist on the government. The clash of cultures experienced by many children must have also been difficult. The children from the cities had been tarred by a reputation that was undeserved – but many of those in rural England expected children to be riddled with parasites and to engage in anti-social behaviour. Such was the perception at the time. “I noticed a woman looking at evacuees’ hair and opening their mouths, but one of the helpers said, “They might come from the East End, but they’re children, not animals.” R Baker, evacuee from Bethnal Green. However, many mothers brought their children home during the ‘Phoney War’ when it seemed clear that the danger of bombing had been exaggerated. By January 1940, about 60% of all evacuees had returned to their home. The return of these children was not in the government’s plan. Many schools remained shut in city centres and a social problem occurred that had no obvious cure – so-called ‘dead-end kids’ who were left unsupervised for most of the day as their fathers were away with the military and their mothers were at work in the factories. It is difficult to know whether this problem was overstated or not but while these children remained in city centres they were a potential casualty of German bombing. London was obviously targeted during the Blitz, but other cities were also badly bombed – Plymouth and Coventry being obvious examples. 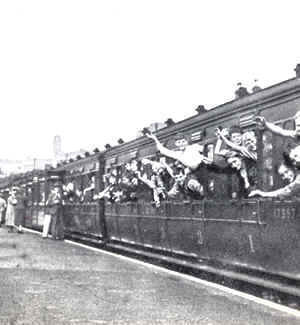 In London, ‘trekkers’ took their children out of the centre at night (during the Blitz) and went to the nearest open ground that might represent safety. The government did not recognise the existence of ‘trekkers’ as their understandable response to bombing did not fit in with the ‘stiff upper lip’ that the government portrayed in their propaganda films. Whereas the American film ‘Britain can take it’ represented Londoners as people with huge resolve, the reality was different. However, by the end of 1941, city centres, especially London, became safer. Life for children regained a degree of monotony. Rationing ensured that everyone got their food. Life could never be normal in a wartime situation but the fear of gas attacks had all but gone and the attacks by the Luftwaffe was a memory. Though cinemas were meant to be shut, many opened. The seeming normality of life on the Home Front was shattered in 1944 when the first of the V1’s landed. Once more, London was targeted and children were victims. The danger faced in London was greatly increased when the V2 attacks started and the casualty figures mirrored those of the Blitz. The attacks by both V1’s and V2’s only ended as the Allies advanced up through Western Europe after the success of D-Day. What damage did the war do to those children who survived it? This is difficult to know as physical damage was visible and could be dealt with but the psychological damage some must have suffered was difficult to measure – even if anybody tried to do this. In the immediate aftermath of VE Day and VJ Day, returning soldiers were given priority and an emphasis was placed on the return of ‘family’. Children and their welfare seemed to come lower down the list of priorities – the return of a father, according to some, would be enough to restore classic family virtues to society. Psychological assessments were far more basic in 1945and in the immediate years after the war. ‘Pulling yourself together’ and the ubiquitous ‘stiff upper lip’ were frequent solutions to both adult and child problems. There is also little doubt that the government wanted to portray Britain as a country that had won the war and was harvesting the benefits of it. Fragile family bases did not fit in with this. The above deals solely with children from Britain and not the rest of Europe. Children living under occupation must have lived in a manner few can comprehend unless an individual has been through similar situations. Children in Poland, the Netherlands, Belgium, France etc would all have experienced the terror produced byBlitzkrieg. Occupying troops could be brutal as the children at Oradur-sur-Glane and Lidice found out. Young German boys were used by the Nazi Party in the final days of the Battle of Berlin. What is thought to be the final picture of Hitler was taken when he pinned Iron Crosses onto the uniform of child soldiers in the garden of his bunker in Berlin. The bombs at Hiroshima and Nagasaki killed thousands of children. The crimes committed during the Holocaust involved countless thousands of children. The first experimental ‘gas chambers’ were used on German children who were mentally incapacitated. Joseph Mengele specifically targeted children for his experiments at Auschwitz. “The forgotten victims of World War Two were the children.” Juliet Gardiner.